Some bands carve out careers based on subtlety, good taste or an ability to tune into whatever style of music is popular at the time. The mandate for Dream Theater, on the other hand, has been to go so far over the top that they might as well be astronauts. Fusing the pompousness of progressive rock and the bombast of heavy metal in equal measures, the US-based five-piece have become the missing link between Metallica and Rush on the one hand, and Yes and Marillion on the other. Since day one, their astonishingly high levels of musicianship have been regularly mocked (mostly by those unwilling to put in the practice), rendering Dream Theater unfashionable. But their very lack of cred, plus an unmistakable ‘X’ factor, have enabled them to thrive beyond anyone’s wildest dreams. Each of their albums now sells upwards of half-a-million copies. In London on their last UK tour in January 2004, the band played a sold-out Hammersmith Apollo (approximately 5,000 fans, with seats removed downstairs). When they return in October, either Wembley Arena or the Royal Albert Hall now beckons. September this year (2005) marks the 20th anniversary of Petrucci and bassist John Myung’s first meeting with drummer Mike Portnoy, in the cafeteria at Berklee College Of Music in Boston. The prompt was Portnoy’s T-shirt of the band Talas. Veterans of bassist Billy Sheehan’s shows in the New York suburb of Long Island (also Portnoy’s home), Petrucci and Myung immediately knew they shared a common love. Later, with the usual modest goals, the trio were joined by keyboard player Kevin Moore and formed a band called Majesty. As Majesty’s professionalism grew, Charlie Dominici replaced their initial choice of singer and the group signed to MCA subsidiary Mechanic Records. On the eve of their 1989 debut album, When Dream & Day Unite, a lawsuit from another band also called Majesty arrived, and they became Dream Theater, after a disused cinema in California. When Dream & Day Unite was well-received by the critics, but the band’s grave doubts regarding vocalist and label – Dominici had to be told what to sing; and they were “guinea pigs” for Mechanic, who later went bust – ensured that both were short-term arrangements. “Charlie was older than us, and he had a great sense of melody,” Portnoy explains. “He was very talented, but in the wrong band. It was like Billy Joel singing with Queensrÿche. In the mid-to-late-80s we wanted someone with a high, operatic voice. Before the label’s cash-strapped demise, Dream Theater could only afford to gig on the local New York circuit. The situation only worsened after Mechanic’s liquidation,,which contributed towards the dismissal of Dominici in late 1989. It would take the band two years to find the right replacement, during which time the prospect of continuing as an instrumental four-piece was considered. 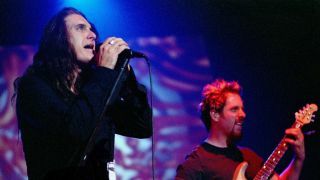 Up in Canada, one-time Coney Hatch frontman Kevin LaBrie was oblivious not only to Dream Theater’s fruitless audition process but also to their very existence. Then in January 1991, Pierre Paradis, manager of Canadian proto-thrashers Voivod, informed the then Winter Rose singer of the vacancy. One listen to the demos of the group’s new material was all it took. Younger, more charismatic and more camera-friendly than Dominici, LaBrie was exactly what Dream Theater were looking for. With one Kevin already in the band and confusion between the two Johns in mind, just one thing needed changing. Reverting to his middle name of James, LaBrie was hired. By now a deal with Atlantic Records spin-off Atco wasn’t far away. Years of almost religious devotion to playing their instruments were about to pay off. When Kevin Moore quipped that all the band’s groupies were male musicians, he wasn’t far from the truth. Portnoy’s excesses (more of which later) were still in control at the time, and the band’s hunger for success would not be sidelined by any of the usual distractions that have ended many a career. In 1992 the new-look Dream Theater released their second album, Images & Words – which many still rate as their definitive work – and went out on the road opening for Iron Maiden on their Fear Of The Dark tour. With reviewers falling over themselves to praise Dream Theater, and the track Pull Me Under getting radio and MTV exposure, Atco couldn’t believe their luck. Of course, record companies are mostly in the business of pursuing a more short-term fix, and over Dream Theater’s next few albums the issue of commerce versus artistry became ever thornier, ultimately creating festering resentment on both sides. Along with other issues, it would almost cause Dream Theater’s demise. “The pressure was definitely on with the next two records,” Portnoy acknowledges of the 1994 and 1997 albums Awake and Falling Into Infinity, the latter not only introducing a new keyboard player in Derek Sherinian, but seeing the group bowing to the label and collaborating with hit-maker songwriter Desmond Child (Bon Jovi, Aerosmith, etcetera), even if it was on just one track, You Not Me. Clearly, things couldn’t continue as they were. But strong grass-root sales and a near-obsessive cult following around the world eventually tipped the scales in Dream Theater’s favour. The group had long-since broken their duck in the UK, where they recorded 1993’s mini-album Live At The Marquee. They also appeared at the legendary London jazz venue Ronnie Scott’s in January 1995, where they played their Uncovered concert. Running through material made famous by Deep Purple, Queen, Led Zeppelin, Journey, Kansas,U2, Elton John, Pink Floyd, Tori Amos, Genesis and The Beatles, Dream Theater were joined on stage by Steve Howe from Yes, Marillion’s Steve Hogarth and Steve Rothery, and Barney Greenway from Napalm Death. Many of the evening’s performances later appeared on the mini-album Change Of Seasons, which, in typical Dream Theater fashion, featured a grandiose, 23-minute title track. For Portnoy, the sea change presented the opportunity of a further, personal watershed. He entered Alcoholics Anonymous. The flip side of the group’s new-found independence from the label was that it ratcheted up the pressure. And from a UK perspective, Dream Theater’s popularity lagged behind countries like Italy, Holland and Brazil, where they were bigger than more fashionable names like the Foo Fighters. In a 1997 interview, Portnoy dismissed the British market as “lame”, lamenting that playing here jeopardised each European tour’s profitability, and telling me with a shrug: “When we do come, we just get slagged by the magazines”. Bringing ex-Dixie Dregs keyboard player Jordan Rudess into the band in February 1999 was one of the things that helped to smooth Dream Theater’s commercial breakthrough. The truth is that Sherinian was ousted in order to accommodate Rudess (who studied music at the prestigious Julliard Academy), with whom the group had played one solitary gig after Kevin Moore’s departure. With the band left to their own devices by the label, 1999’s Metropolis Pt 2: Scenes From A Memory cemented Dream Theater’s future. Their first full-blown concept album told the unlikely tale of a man who, under regressive hypnosis, learns that in a previous life he was a woman who was brutally murdered back in the 1920s. To make the record, the band admit to having tapped into the vibe of records like Genesis’s The Lamb Lies Down On Broadway, Queensrÿche’s Operation: Mindcrime, and even OK Computer by Radiohead. But it was Pink Floyd’s The Wall that inspired them the most. What came next, in 2002, was a two-CD set that Portnoy now calls “a modern-day version of Tales From Topographic Oceans”, Yes’s controversial 1974 concept piece. The title track alone – _Six Degrees Of Inner Turbulence_ – took up 42 minutes. This year Dream Theater will open for Megadeth and Iron Maiden, having also gigged with Yes. Straddling both genres, Dream Theater are in the virtually unique position of appealing to both sets of fans.